Casein kinase 2 alpha 1 detected in A375 human malignant melanoma cell lysates with Human anti casein kinase 2 alpha 1 (HCA064). Western blot analysis of Jurkat human T cell leukemia whole cell lysate probed with Human anti Human casein kinase 2 alpha 1 antibody (HCA064) followed by followed by HRP conjugated F(ab')2 Goat anti Human IgG, visualized by chemiluminescence. 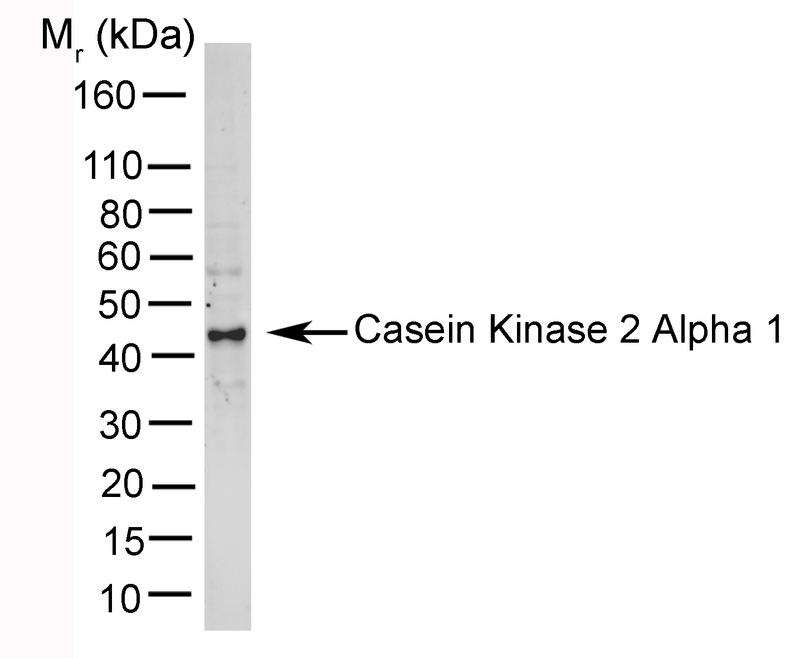 Human anti casein kinase 2 alpha 1 antibody, clone AbD05928 recognizes human casein kinase 2 alpha 1. Casein kinase II (CK2) is a heterotetrameric serine/threonine protein kinase consisting of two 44 kDa catalytic subunits (CK2-alpha) and two 26 kDa regulatory subunits (CK2-beta). The alpha subunits contain the catalytic activity while the beta subunits undergo autophosphorylation. CK2 is constitutively expressed in most cells and tissues and is highly conserved among eukaryotes. It participates in a wide variety of cellular processes including protein kinase networks that control cell cycle progression and cellular stress responses with over 300 substrates. Consequently, fluctuations in the expression of CK II have been linked with various human diseases and most notably, certain cancers (breast, prostate, lung etc). A monovalent human recombinant Fab (lambda light chain) selected from the HuCAL® GOLD phage display library, expressed in E. coli. The antibody is tagged with a myc-tag (EQKLISEEDL) and a his-tag (HHHHHH) at the C-terminus of the antibody heavy chain. This antibody is supplied liquid. Full length recombinant human CK2-alpha1 expressed in Sf9 cells.